So far I have only tried the squeeze station and one-time use pouches, but I would love to try some of their other products, especially the reusable pouch/container! In this post I will share with you my experience with these products, how they work, and some tips on using them! 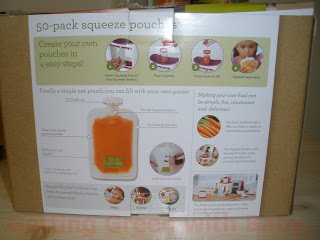 *Note: I have quite a few pictures of the squeeze station and pouches in my post on making baby food, so I have not included many in this one. If you’re interested in seeing the other pictures, follow the link HERE. 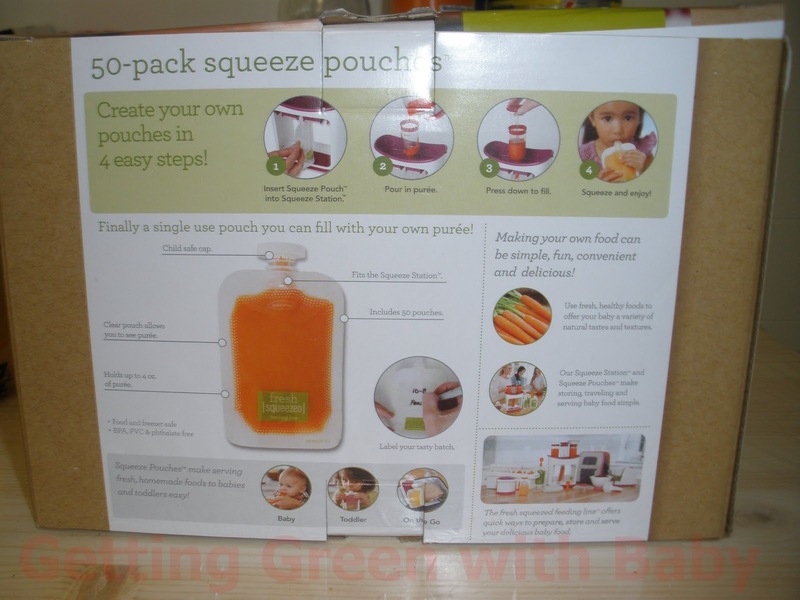 Admittedly, we never made baby food BEFORE we got the Infantino squeeze station and pouches, but they have made making it SO easy and much less of a daunting task as originally thought. The thought of having to mess with ice cube trays kind of bummed me out, so I was glad we saw these products before we had to try that out! Now, I have a few tips relating to the plunger device. I have found that it works a little TOO well. Many times it creates such a tight seal that it pushes air down inside of the pouches. This is kind of annoying since you want them to be as full of FOOD as possible! My husband suggested this and it’s going to sound a little ridiculous, but it seems to work. Making sure you have the cap on tight, hold the pouch by the cap and swing it back and forth. The idea is to force all of the food down to the bottom of the pouch, so then you can take the cap back off and push the excess air out without spewing food in the process. Pulling the plunger back OUT of the tube once you’ve pushed all of the food in can sometimes cause some of the food to be sucked back up into the tube because again, the plunger’s suction works a little too well. Before you take it back out, just unscrew the tube from the pouch opening. Then you don’t have to worry about sucking any food back up into the tube and pushing air back in and yada yada yada. It also helps getting the plunger out if you wiggle it back and forth instead of trying to pull it straight out. That has worked better for me, at least. Another tip I would like to share is to use a spoon. I don’t know about you, but I can make an ungodly mess if I try pouring things from one container into another. Therefore, I use a large spoon to scoop the purees from the food processor and pour them into the tubes. So far this has worked nicely for me with everything but mangos and bananas. They were just too runny. I also like the squeeze station because it doesn’t take up much room in our already cluttered kitchen. Once everything has been washed and dried, of course, you just pop on the bottom tray, click the filling tubes to the pegs on the inside of it, and put the top tray in place. Voila! Tuck it away until the next time you need to make baby food. We chose (and like) the one-time use pouches for several reasons. First of all, while I really do hate being wasteful, we are cheap. You can get 50 of these pouches for a decent price. This also means being able to make larger batches up at a time, which I like. I don’t want to or plan on making baby food every week, so we do several different fruits and veggies at a time and freeze the majority of them and put one of each in the fridge. If I remember correctly, it’s ok to keep them in the freezer for about 3 months and 2-3 days in the fridge. I like being able to have a larger variety too because of the amount of disposable pouches you get per box. We have been making Myka’s baby food for a little over 2 months now, have made 4 batches of varying fruits and veggies, like I said, and just now ran out of pouches this last time. I will admit, we bought off brand spoons that attach to the disposable pouches, but it’s still a neat idea. We haven’t made pre-mixed blends of food for Myka yet so we still use a regular kid spoon and bowl. I can’t wait to try it out, though, since it will “cut out the middle man” and there won’t be nearly as many baby dishes to wash! 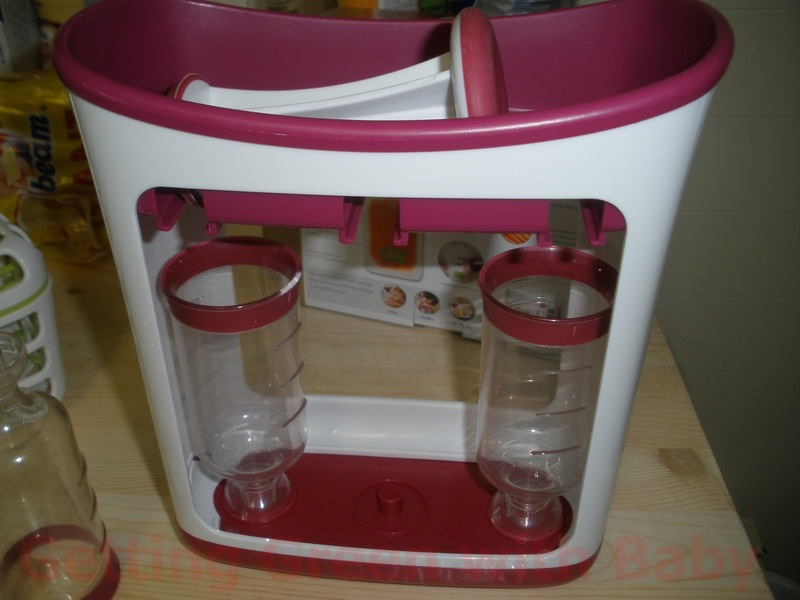 If you would like to check out more of the Infantino Fresh Squeezed products or purchase some for yourself, click HERE. *Getting Green with Baby was not compensated in any way for this review. All opinions expressed herein are my own. I am not affiliated with Infantino in any way. I simply like their products discussed in this post and felt like sharing them with others. I used to make my own baby food, but I stayed away from certain veggies b/c the prep was intimidating to me! This tool looks interesting. There are a few things that I never want to try myself again, like butternut squash. Biggest pita ever!